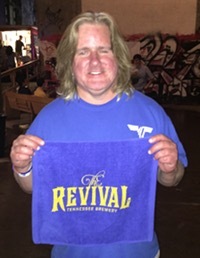 The Memphis Farmers Market party last night at Loflin Yard was probably the best party they have ever thrown. What a perfect space. I didn’t take photos of all my food but these two plates say it all. 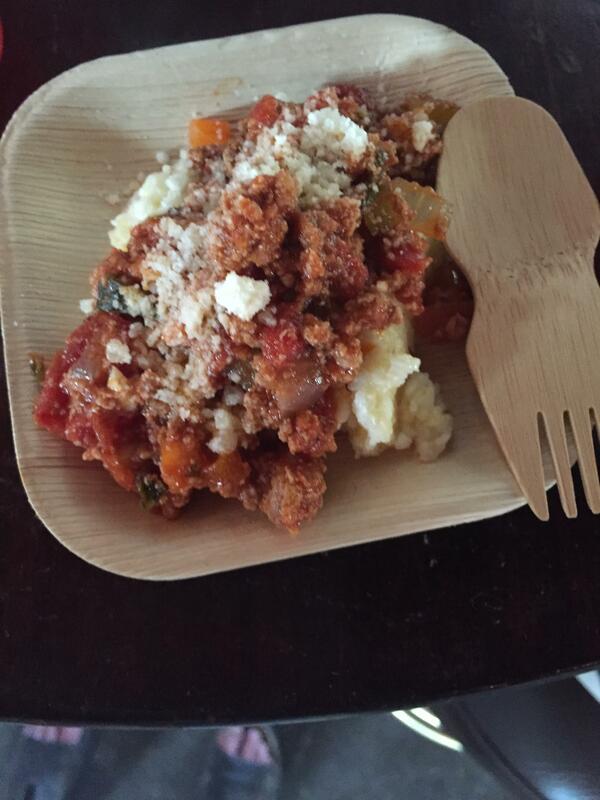 A meat sauce over grits from Felicia Suzanne’s. OUT OF THIS WORLD. The past four days have made a Felicia fan out of me for sure. 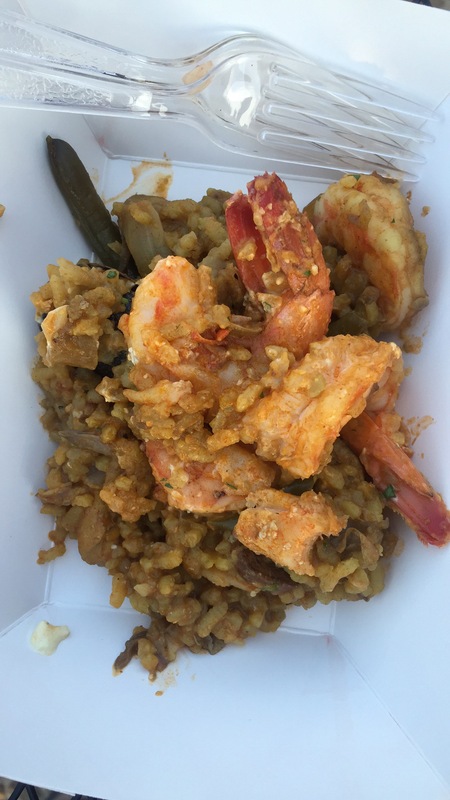 Chef Patrick Reilly of Majestic Grille got out the paella pan. That thing must be three feet in diameter. He served me not one, not two, not three, not four, but FIVE scrumps in my bowl of paella. “I’m not going to need to eat again until about Thursday,” I thought as I finished my food. The space is absolutely beautiful and perfect for a Farmers Market event. 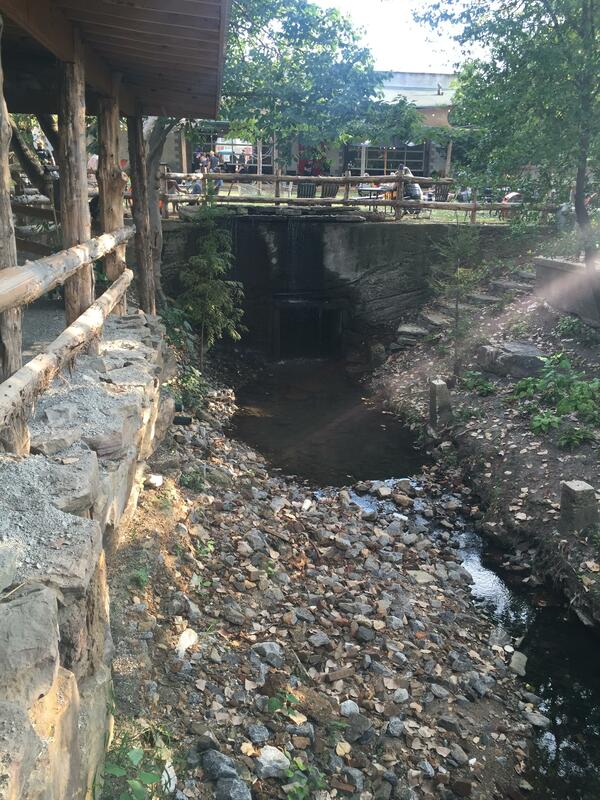 Here’s a photo I look of the creek that runs through Loflin Yard. I wonder if there’s a troll who lives under the bridge? I was a ride-sharing maniac this weekend. About 6:30 I ordered a Lyft to the Blind Bear. However, with today off and a desire to make last night a late night, I didn’t want an 8-and-a-half-hour run at the Bear. I needed an interesting diversion. Right around that time, my friend Hannah posted that she was bartending at Aldo’s Pizza Pies Midtown until 11. My friend Captain Sparkles was sitting next to me at the Bear. “Want to grab a ride out there and see Hannah?” I asked. He was up for it. I have girls I go see Downtown. First there was FML (Feeny, Lacey, Mary) then MLS (Mary, Lacey, Stacey) and now a different MLS (Mandy, Lacey, Stacey) at the Blind Bear. There’s Jessica at the Goose on Wednesday and Thursday. There’s Melissa Monday at Bardog. “But you’re my only girl in Midtown,” I told Hannah. We caught a Lyft back Downtown (making it my first weekend ever spending triple digits on Lyfts) and I finished the evening at the Bear. I tried to tab out but Colin informed me that if I stayed six more minutes, it would be last call and I could say I closed the Bear. So I stayed. Okay. On to the news. This won’t be a really newsy post because I slept until almost 11 today and I have absolutely no idea what’s going on. But here’s what I’ve got. Flight, the restaurant at the corner of Main and Monroe, is looking to hire a Daytime Reservation Specialist. Speaking of Monroe… MLGW is coming up on 10 months digging The Giant Hole on that block. This morning they hit a gas main and the fire department came out and closed the block of Monroe between Front and Main. You know, there have been clown sightings all over the southeast lately but they say there have been none so far in Memphis. Go to The Giant Hole and you will see plenty of clowns standing around. This is going to be a good conversation: The Civil Pour is all about civil discussion, not arguing or debating, just stating your opinion and listening to those of others in a respectful manner. The Civil Pour IV happens Thursday, October 6 at Loflin Yard, and the conversation will tackle one of the most sensitive issues of all: race. Is racial profiling a thing? Are we in a post-racial era or is there still injustice? Can anything be done about systemic racism? The fact that these issues can be discussed openly and differences of opinion tolerated gives me hope for America. We need exchanges of ideas like this. Just as I was writing this post, I found a really good website: Memphis Flavor. They sell tastes of Memphis, as well as Memphis apparel. The reason I found it is that I was Googling the Flo’s tomato jam that my friend Nate had with his fries Friday at lunch. Their brands include Flo’s, Central BBQ, Killer Hogs, Germantown Commissary, Brother Juniper’s, Dinstuhl’s, Makeda’s, Nikki’s Hot A$$, and Victory Lane BBQ. 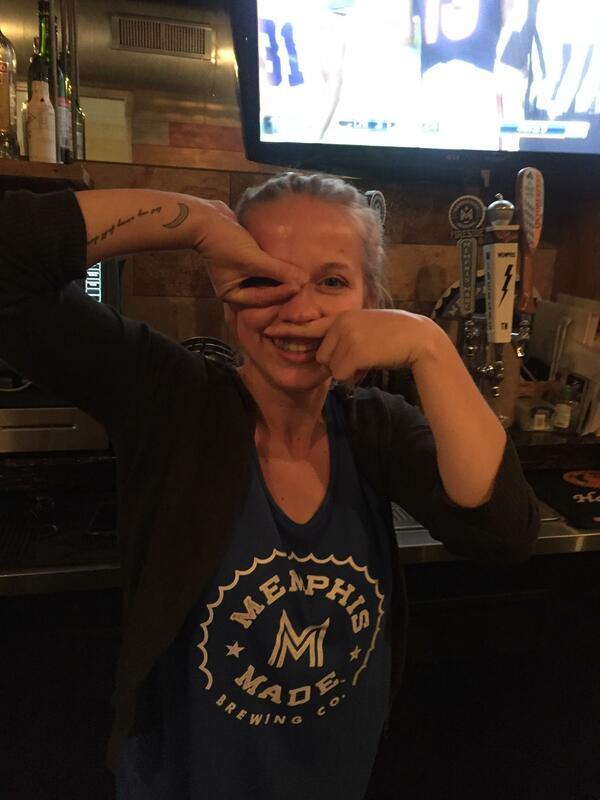 They even have High Cotton trucker caps and Memphis Made T-shirts (hey, there’s my favorite pair of librarian glasses!) I think I have found my site for Christmas shopping this year. RIP Arnold Palmer. Although I am not a huge golf fan, I appreciate what a legend he was in that sport, and what an inspiration he is to today’s pros. All right, time to hit Publish and think about where I’m going to eat lunch. I’ve narrowed it down to a walk to Westy’s for one of their wild rice dishes, or a much shorter walk to Court House Deli for their loaded chili with jalapenos, cheddar, and onions. A trip to one of the the pho restaurants in Crosstown is under consideration, as is a drive to the Jack Pirtle’s on Thomas Street. Back to work tomorrow. It has been a fantastic long weekend and I’m not done yet!